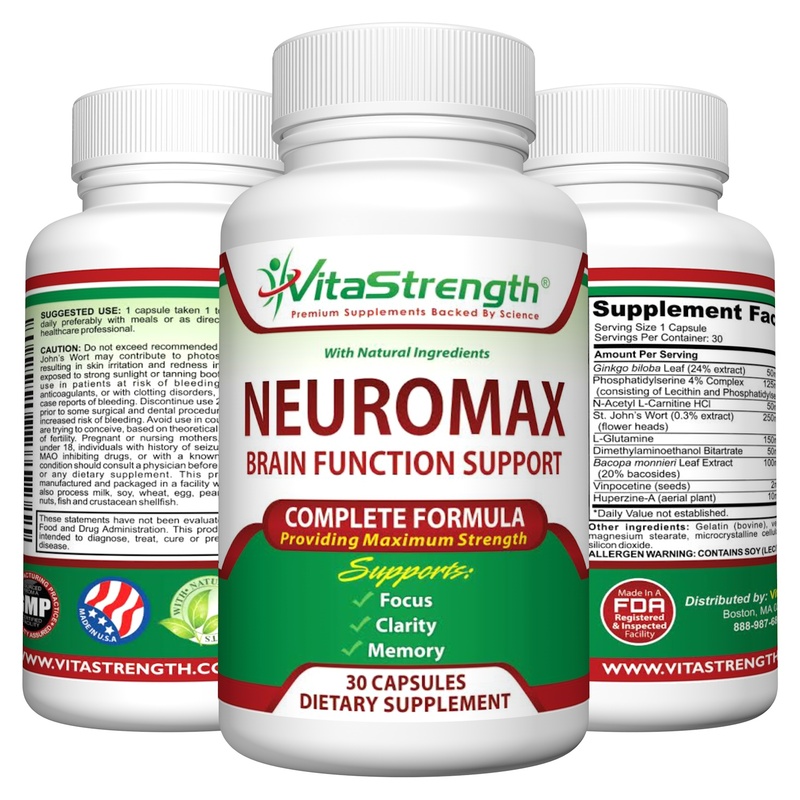 Order NeuroMax- Premium Brain Function Support Today! BOOST YOUR BRAIN POWER: VitaStrength’s brain supplement increases mental health, memory, focus and clarity to help you concentrate better and acts as a memory booster to help you retain information and recall it with greater ease. 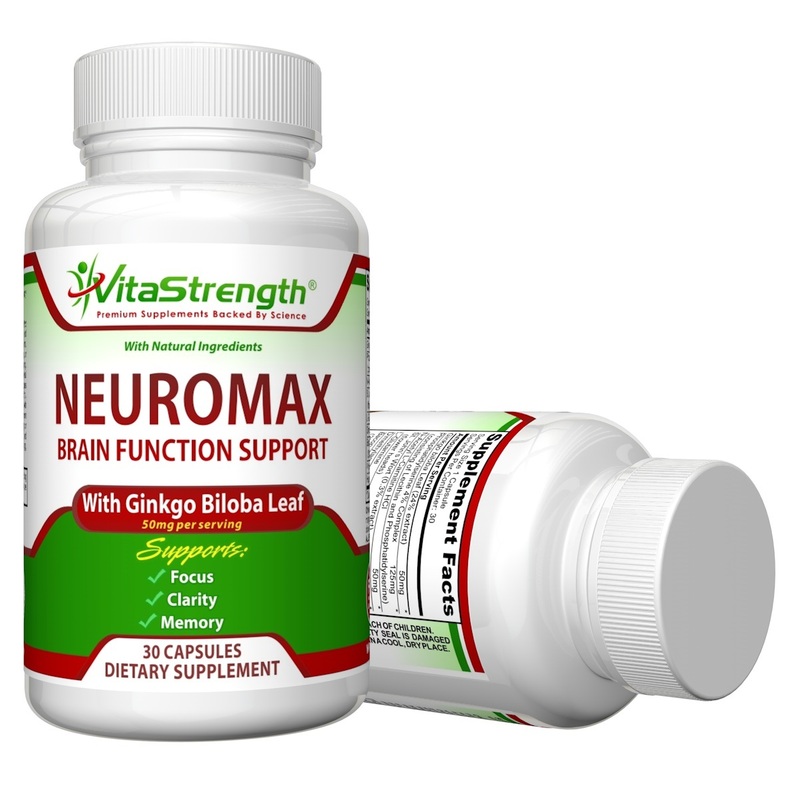 EXCLUSIVE BRAIN ENHANCER BLEND: NeuroMax mental alertness and memory pills contain just the right blend of Ginkgo Biloba, St. John’s Wort, Bacopin and other natural herbs and nutrients that are proven to provide brain function support and promote brain health. ALL NATURAL BRAIN FUNCTION SUPPORT SUPPLEMENT: We never add medications or preservatives to our concentration pills. 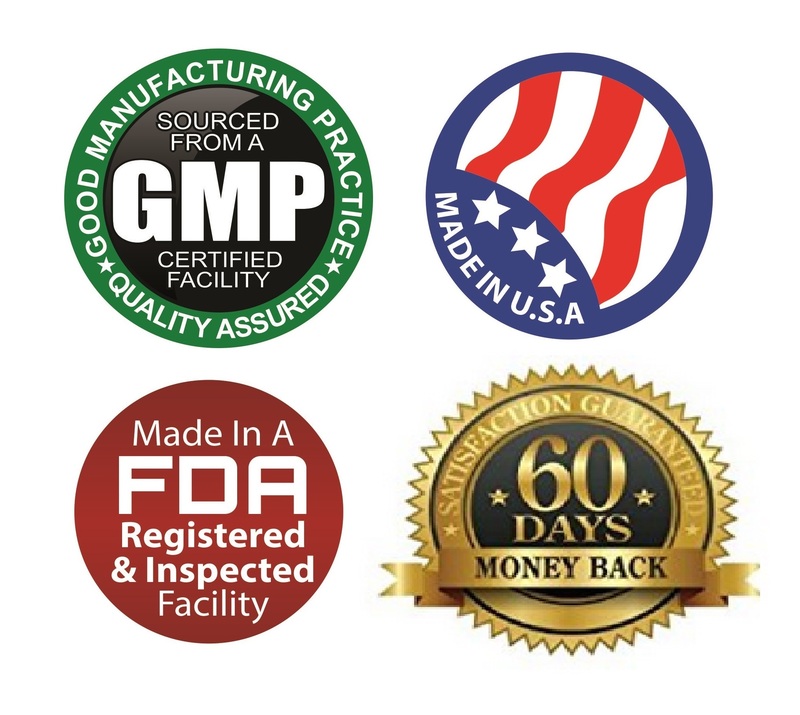 PREMIUM QUALITY SUPPLEMENT: Our memory pills are made in the USA at a GMP Certified, FDA inspected and approved facility for quality you can count on. Are you sick of forgetting the names of people you meet? Struggling to focus on tasks at work or at home? Feeling as if you’re in a brain fog and unable to concentrate? If you’re in need of a brain power boost, VitaStrength’s NeuroMax- Premium Brain Function Support can help and provide you with a natural way to improve mental functioning and memory. Our brain supplement is completely free of synthetic ingredients and is ideal for anyone looking to boost his or her brain power. We’re so confident that VitaStrength’s Mental Focus & Memory Booster Supplement works as a natural brain enhancer that we back up every bottle sold with a full 60-day money-back guarantee. You truly have nothing to lose but that brain fog and those memory problems that are making it hard for you to function at your best. Boost your brain power the natural way with the best concentration pills and memory pills! Order NeuroMax- Premium Brain Function Support Today! These statements have not been evaluated by the Food and Drug Administration. Products are not intended to diagnose, treat, cure or prevent any disease. Personal testimonials reflect individual experiences of customers and distributors are not necessarily typical of the results you may obtain. Weight loss varies with individual effort, body composition, eating patterns and exercise. If you have a medical condition or are pregnant or nursing, VitaStrength recommends that you consult your healthcare professional before starting a VitaStrength product regimen. I wasn’t sure what to expect when I started taking these Neuromax capsules. I gave them a try since during the winter I feel like I have a bit of a brain fog from being less active. I also work from home so I sometimes find myself in a room and forgot why I went there. I’ve also been just craving a bit of a boost over these past few weeks. These supplements are easy to take and require just one a day. However, I was a little disappointed to discover that the capsule is made of bovine gelatin since I try to keep to a vegetarian diet. I took them anyway but I know that this could be a deal breaker for people wanting to avoid animal product. They also contain a small amount of soy which I know can also be an issue for certain people. Occasionally, I don’t sleep well and when I have a busy day I will drink and energy shot or take a caffeine tablet to avoid the afternoon slump – since I don’t drink coffee. You can usually tell when these types of products kick in. I kept waiting for that buzzy feeling but it never came. I wasn’t sure it was working but after a few days I just felt more clear and less absentminded (no more wandering into the kitchen and forgetting why I was there.) I noticed that my energy levels have been more even and I’m more able to concentrate on tasks with less effort. I don’t know if this is a common side-effect but I also have felt a greater sense of calm since taking these. The changes have been subtle but noticeable. I’ve only been taking these a week so I haven’t seen much difference in my memory yet but if I see an increase, I’l be sure to update my post. Focus & Memory Booster. It is still early; but I definitely have felt and noticed a difference. My concentration seems to be lasting a little longer and is sharper. I have been more focused since starting this supplement. I’m excited to see what happens with continued usage. The pills are easy to swallow and I haven’t noticed any nasty aftertaste. Great supplent to aid me while doing college work. This, along with other various nootropics that I take from time to time, really seems to help with focus and memory. I haven’t been groggy or forgetful after taking these, so I assume they are working as I hoped they would! These pills are amazing! I have actually tried many different pills like this from other companies but I just haven’t had good luck until now. I always find that they are way to expensive, have a terrible odor, or just don’t work at all but these are a different story. They work incredibly well for me and they come in a very reasonable price for the amount you get at least in my opinion. If you are looking for some high quality and reasonably priced pills this is an amazing option. I have been forgetting a lot in the last few months and this supplement really peeked my interest. I have been previously taking some of the ingredients in this supplement and thought that this could be great! Since I have been taking them I have noticed a increase in my ability to focus and remember things. I am so glad I had the honor to try this wonderful supplement. I have quite a bit of a problem being able to concentrate. I’ll be doing something or reading a book or magazine, newspaper, etc. and my mind will wander. I have somewhat of a problem with keeping my mind focused. I’ll be listening to someone or trying to pay attention, but sometimes there are more important (or not) things to think about. I don’t know how many times I do this a day! I envy the people that can go to school or learn something the first time and retain it. Not me, I have to do it or hear it several times sometimes. This supplement helps me to concentrate and focus a little bit better. I’m not giving myself high hopes of being a genius someday, but any help I can get to stay on track with my mind is appreciated. I see things and wonder how those people remember that! I don’t know how many times I’ve gone off to do or get something and forgotten what I was going to do. I’m sure that some of it has to do with my age, but I’ve had this problem for as long as I can remember (probably why I didn’t do so hot in school)! I’ve never taken a supplement for mental focus and memory, so I’m wondering how I’ll be in 3 or 6 months from now. I’m willing to give it a try anyways. I’ve got high hopes of being at least a little bit better at my concentration and memory abilities. I also like the fact that this product is all natural. I was excited to try this product on my aged mother. she is over 70 years old and was having issues free calling things. This product states that it would improve mental alertness. The ingredients state that it is the right blend of Ginkgo biloba st. John’s wort and other natural herbs. Because of the profession that I am in I do understand that these properties may help in mental alertness. My mother has been using these for some time now and feels like she is seeing improvement in her memory. I’ve always had really good memory, however, as I’ve gotten older I’ve realized that my memory isn’t what it used to be. I decided to give a memory boosting supplement a shot to see if it would help. I’ve noticed a considerable difference in my ability to recall information and not walk into a room forgetting why I was there. I wouldn’t say that I’m a memory genius by any stretch of the imagination, but I’m more alert to information and retaining. I work 3rd shift and go to school so I’m always looking for safe ways to boost my energy and help me focus on schoolwork. This product helped me get an entire project done without normal loss of focus. his Neuromax Supplement made me feel focused and relaxed. It contains Huperzine A, a natural nootropic, very well known in the market. Great combination of ingredients with no after taste, no side effects that I could recall anyway. This bottle will last for 30 days and I am sure that you will be able to feel a difference on the very first week of consumption. Don’t get me wrong, this is not some kind of natural supplement that will produce you an excited level, you wont get your serotonin level higher than you should so it is kind of safe to consume this product. This formula contains certain amino acids that will improve your brain function too. 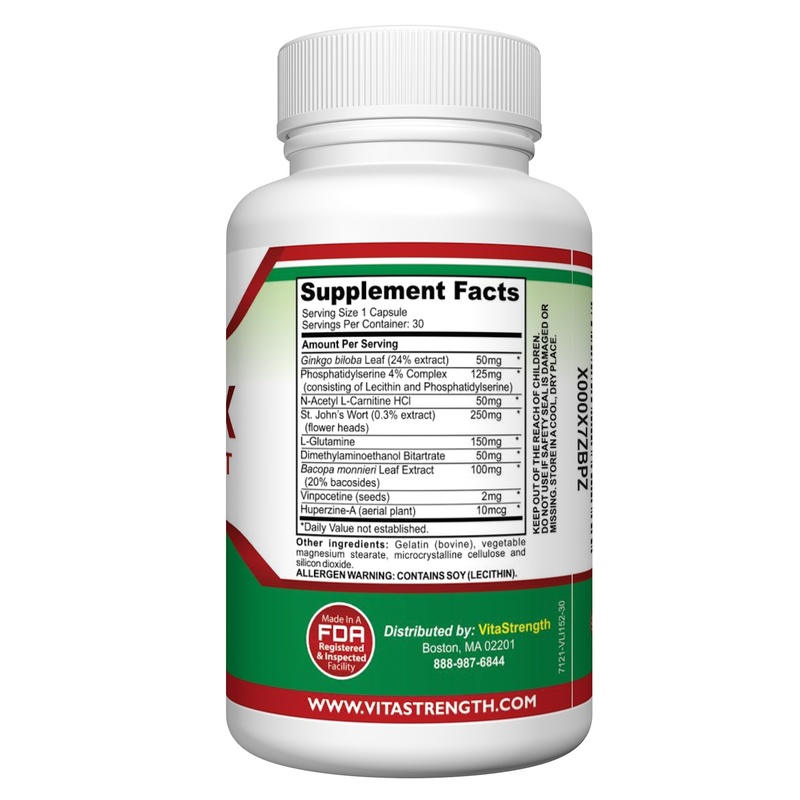 I take tried other nootropics, memory boosters and mental focus and this specific brand VitaStrength is made with quality ingredients as I have noticed its effects and I am happy of taking this supplement. I’m pretty wary of any supplements or nootropic boosts, especially as so many are flooding the market nowadays. I decided to give these a try since lately I’ve been experiencing some brain fog and just overall fatigue and laziness. I often work from home and sometimes it does prove harder than other times to get out of bed and get the ball rolling! That’s why I decided to give these a try. These supplements are very easy to take and kick in in just one day! The capsules dissolve easily in my stomach and my vision gets a bit more clear after 45 minutes or so! It’s the same ‘kick in’ feeling I get when I take some caffeine or ADHD medication, and that’s how I know it’s working. When I don’t get enough sleep and know I have a busy day ahead I’ll take some caffeine to avoid getting too tired, but with this product I’ve had to do that a lot less! Everyone is different, has different physiological needs and reacts differently to different medications. All we can do is share our experience of this supplement and what we know about the ingredients. For my husband, Brain Power Boost has had a positive impact, we find it to be of a high quality and it has some good ingredients, but it is not a high enough dose and it lacks a strong stimulant to bring it all together. he do have a very stressful job and suffer from anxiety. i wanted to see if there was a supplement that could help. highly recommended. 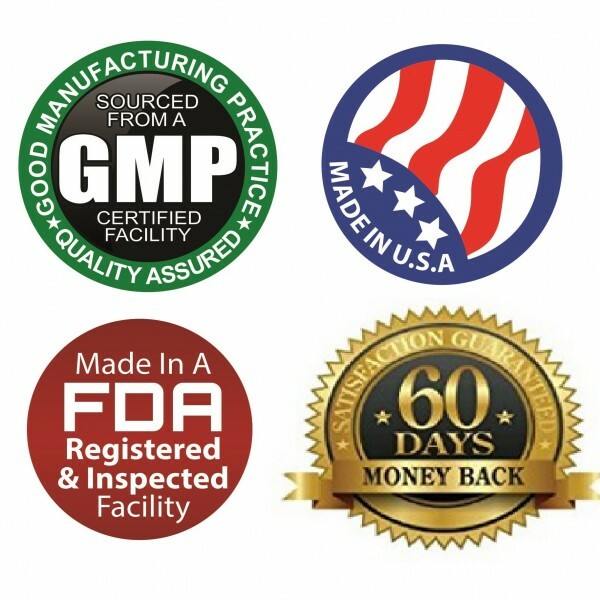 I like that this supplement is all natural and without any fillers or medications, and that it’s made in the USA in an FDA (Food and Drug Admin) Inspected and GMP (Good Manufacturing Practices) Certified facility. When I look at different supplements on the market, it doesn’t seem like all companies seem to be able to make this claim with their products, and it definitely gives me a little more peace of mind. These pills contain a lot of brain support supplements that I was familiar with from seeing my mother taking them (Gingko and St John’s Wort in particular). It’s nice to see a supplement that combines various herbs for an all around support supplement. These pills are easy to swallow and don’t leave any aftertaste. I think it’s also impressive that VitaStrength backs their product with a 60 day money back satisfaction guarantee, which I really don’t see at my local health supply store. To me, it’s nice to see a company that believes in their product, puts their money where their mouth is, an cares about the customer instead of just their own bottom line. As I’ve gotten older I have tended to be forgetful and have problems focusing-at times things can seem sort of foggy. 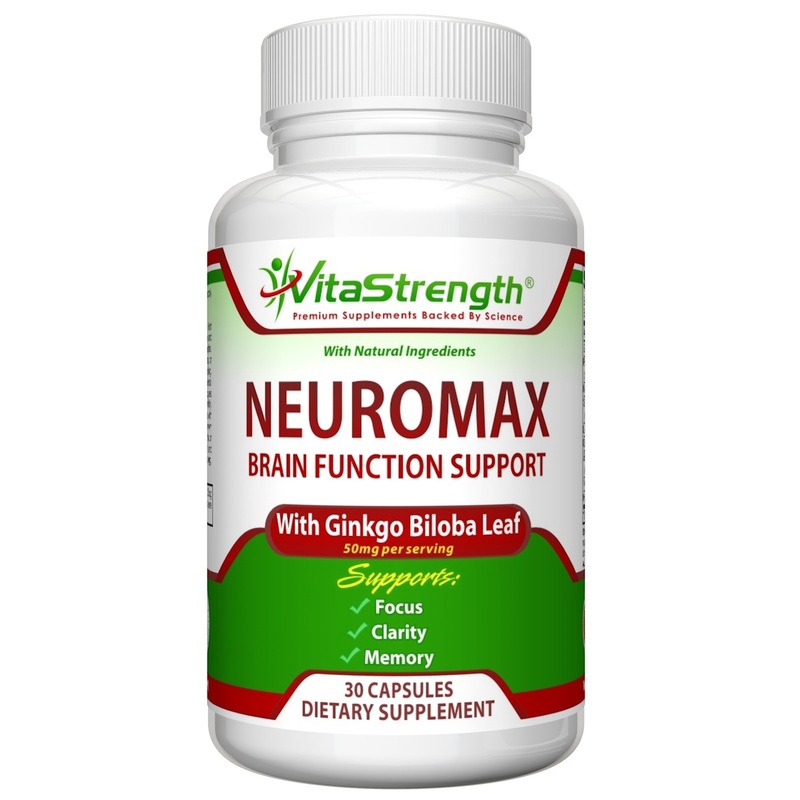 I have heard that ginkgo biloba helps with memory and since it was mixed with other items that are also supposed to help the brain I decided to try these supplements. I’ve only been taking them for a week but they do seem to be helping. I m focus at work has been better and I’m thinking through my problems-rather than giving up because its takes too much effort to continue. I have hopes that it will continue to boost my concentration and memory as its frustrating to not be able to remember the word you want when speaking with others. This product is worth every single penny. The benefits are amazing and once you begin taking it you will notice if you had any prior fog it is lifted quite quickly. Within a few days I started feeling the impact of the product along with the increasement & sharpness of memory and focus! This product has greatly helped my focus, agility to think faster and remain confidence in my memory ability. Its worth a try for sure. As a mom I have a million this running through my head so the CLARITY is great. I was looking for a natural mental focus and memory booster and I can say that this is a great product for that. One of the biggest changes that I see personally is that my concentration is improved. I don’t get so distracted when I am trying to focus, or when I go into a room I would actually forget what I went to do or get. I am more production because I can concentrate and stay on task. For me this works, and I will continue to keeping using. Easy to swallow pills that did not upset my tummy or give me heartburn. Easy to read label and bottle was securely sealed upon arrival. I am excited to see upcoming results. Me memory has been really bad lately… I’m not sure if it is because of my depression, but I can’t concentrate, I can’t memorize anything. So I started taking this as a supplement and I am very happy with my improvement. Bow that I got back to school, I have to put more effort to my studies but I feel confident I will rock all of my tests because this supplement does the job! Very happy I got this. I find my productivity at work to increase when taking this product. I have a hard time concentrating under normal circumstances and find it difficult to retain information which is horrible for somebody whose job requires knowledge of many constantly changing rules and regulations in my line of work. When I take Neuromax, I feel focused and sharp. I am able to drown out the noise of the office and focus on what I am working on. I can remember what I have read or heard in a meeting or phone call. I don’t resort to a note pad full of “to do’s” because I am able to finish all of my daily tasks and remember to finish those that are still pending. I really feel like a new man. More people than ever before are struggling with memory problems. Students are under constant pressure to increase mental performance. Employees in high pressure jobs are fueling their brains with caffeine and smart drugs to stay competitive. Men in my family tend to get Alzheimer’s at an early age and I started taking this when I started to see their symptoms in myself. Taking this improves my thinking speed, ability to recall words, lose track of things less often, sleep better with less of a need for power-naps. As I’ve aged, I can increase the dose and frequency, meaning I’m up to the higher strength, although I’ve found that taking two if the lower dose works better for me each day than one larger dose. I love this stuff! It helps me work a TON. Helps me keep focused at the task at hand and gives me a super clear mind for creative ideas. I’m sure my boss loves it as much as I do. 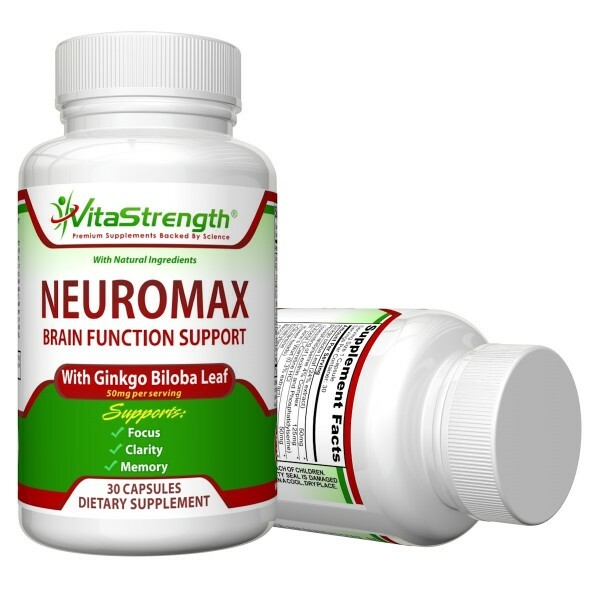 Currently writing this review at the speed of light because of NeuroMax, normally I would have put it off but finishing tasks just feel so rewarding with this!